Seattle’s Pioneer Square and Chinatown-International District will be busier than ever today. In addition to the First Thursday Art Walk in the Square, and JamFest in the ID, the two neighborhoods have gained new eye-catching temporary residents: Storefronts Seattle’s artists and art ventures. From today to February, the new residents will be displaying and creating their artworks and talking about their projects, and we strongly suggest you to stop by their storefronts to see all the creative stuff they are doing. There will be a second round of residents coming in December as well. If you start in Pioneer Square, stop on 2nd Avenue between Cherry and James St to see Melanie St. Ours and LUKE Haynes. Melanie will be in her space chatting with the public about her theater project “One Forbidden Thing.” Next door, you can see LUKE’s take on quilting as contemporary art in his project Gallery LUKE. 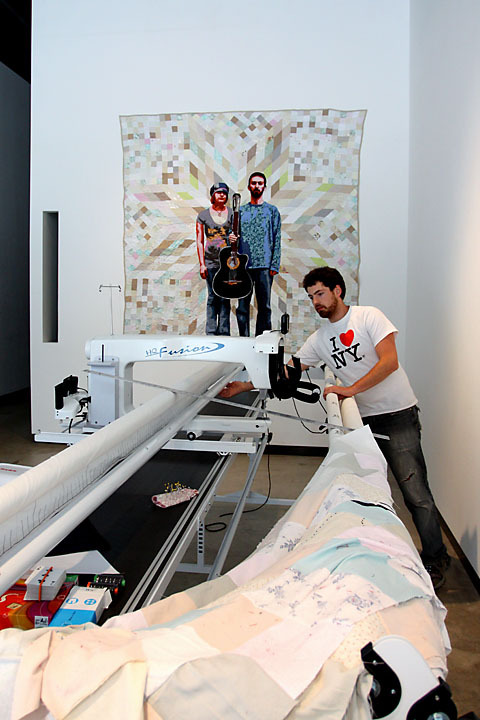 The artist will have quilts and t-shirts for sale, and if you haven’t gotten your LUKE fix by then, you can check out his other show at Some Space Gallery. The next stop is the basement windows of The TK Building (3rd Ave and Prefontaine Lane) where Ingrid Lahti’s intriguing lit words and phrases have been catching the attention and curiosity of passers by. From there, swing down to the historical building at 312 Occidental and find Dan Reeder’s Gourmet Paper Mache dragons before heading to the Chinatown-International District for JamFest. The Chinatown-ID locations are packed with variety. The Bush Asia Center at 409 Maynard houses two Storefronts artists with John Fleming’s installation (pictured right) in the south facing windows and Chauney Peck’s in the east facing windows. Across the street in the 6th and King Building you can see Dora Taylor’s Architecture 101 through the basement windows. Stop there to hear about the architecture classes she’ll be giving to her students in the space. One block over, at Maynard and King, you can play pinball at the Seattle Pinball Museum Project. This group of collectors has packed this space with vintage pinball machines and will share their knowledge of these works of kinetic art to all visitors. 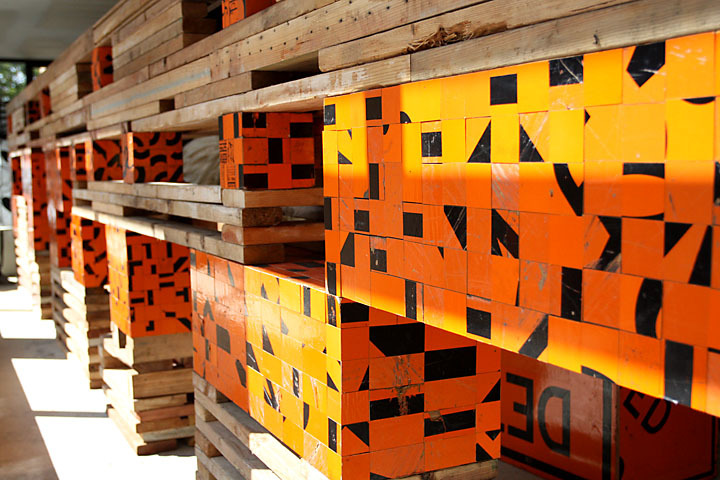 For your viewing pleasure, check out Chris Engman’s installation next door. Folks in the neighborhood have already begun to notice his art by snapping photographs from the sidewalk as they pass by. To wrap up your Storefronts tour, go one block north to Jackson and 7th to visit Videa and Brite Collective. Videa will have video projections to show off, while Brite Collective will be discussing their upcoming community projects with the public. These spaces are sure to be full of creative conversations, so take the time to enjoy your walk and meet the new friendly faces in the neighborhood! You can also checkout the Storefronts Seattle Map and create your own route. Storefronts Seattle’s artists and art ventures will be participating in Pioneer Square’s Art Walk and Chinatown-International Districts’s JamFest this evening. Take this map along with you and follow us on our suggested route! 1 Response to Storefronts Seattle starts today! plus we could use your input on blogs, websites and general publicity….i could offer some insight onto leases and rentals and landlords….